It's been five months since their last World Cup qualifier, but Scotland's women are determined to continue the winning momentum that's taken them to the top of Group 4. Anna Signeul's side have seen off the Faroe Islands, Bosnia and Hercegovina, Northern Ireland and Poland with convincing victories - and scored 18 goals along the way. They're now looking to gain maximum points from their upcoming double header against the Bosnians and Poles, who on Saturday travel to Fir Park seeking revenge for their 4-0 defeat in October. 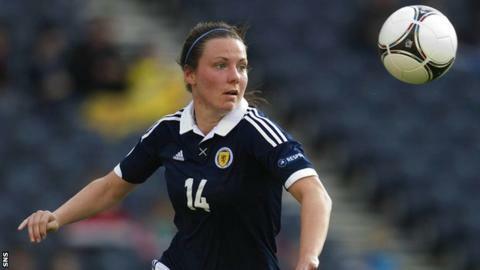 A hat-trick from Jane Ross and a strike from Jo Love sealed the victory for the Scots against Poland. However, the scoreline perhaps flattered the visitors and defender Rachel Corsie admits they're wary about the visitors. "They're one of the hardest sides we have to play against and, although it seemed a comfortable victory, we're very much more cautious that they could cause us problems," she said. "I think we're still favourites, though, and realistically, if we want to give ourselves a chance of going to Canada, we need to see off teams like Poland. "To get the results, we need to make sure we're focused - and, if we can get the three points on Saturday, it will lead us into a stronger position going into the match against Bosnia. "Poland have some good full-time players and they're strong on the counter attack. Chances are, they'll look to defend strongly. "In the last game, though, we were clinical in the box and scoring a hat-trick for us was superb." Scotland may have had several months off from their World Cup endeavours, but they've seen plenty of action in the interim. After an international tournament in Brazil, they secured their best-ever finish in the annual Cyprus Women's Cup in March, finishing fourth overall. Corsie says this has helped them grow physically and, in terms of fitness, it was crucial. "Improving this way was something that was very important to us and I think it can have a big impact going forward," she said. "We've had a lot of time together, which helps things on and off the field, and we have a good bond. "Its been a while since we've had a competitive match, but even friendlies at international level are important. I think we'll be able to maintain the momentum we have and do a good job." With more players back from injury, head coach Signeul could shake things up in terms of team selection and Corsie admits that there is more competition now to gain a place in the starting XI. The former Glasgow City player is now a full-time professional having moved to England to play in the FA WSL for Notts County. She believes that the number of professionals now playing in the Scotland set-up is having a big impact on their results. "For me, trying to manage a career as a chartered accountant and a footballer was difficult," she admitted. "I know that putting 100% into being a professional athlete has improved my game. "You can never get the most from training if you know you're doing it early morning or late evening between work and I now feel I'm able to compete at a higher level. Its made me a stronger person both physically and mentally. "At the moment, it's perhaps to the detriment of the Scottish league. But, in the long run, I think there will be more professionals in this country as well. "Turning professional will always be a lucrative option for players like myself who want to try it. As an individual, it's an important experience for me. "I could have stayed in Glasgow, but I wanted to try something different and being a full-time professional, sadly that's something you can't do in this country. Hopefully it will come in the next few years.". Scotland head into the match against Poland having risen to 19th in the latest world rankings. Corsie says it's recognition of the hard work both the players and the head coach have put into the game over the last five years. "It's quite remarkable," she suggested. "Not many teams continue to progress year after year. For us to continue to step up says a lot about the work we've done - and hopefully we can only continue to improve."